Stampin' Up ideas and supplies from Vicky at Crafting Clare's Paper Moments: Bloomin' Marvellous Clockworks! The Clockworks background was my starting point here. I stamped it, then wondered what embossing it would look like... and I liked it! I embossed the front of my card base too before attaching the stamped panel to it. I like to run my embossed images through the Big Shot again when I've embossed to get a less bulky, subtler look. The card was ready for its focal point: I stamped flowers from Bloomin' Marvellous (you'll be able to get this set for free in the upcoming Sale-a-bration promotion! ), fussy cut them and decorated each centre with a tiny punched flower and brad. These were arranged with some punched leaves over the background and the banner-style sentiment added. 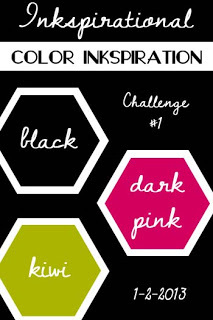 Here's the fabulous colour combination I used from Inkspirational today. There'll be different inspiration each week apparently - colours, sketches, CASEs and photo inspirations, so this looks like a fun challenge to get your creativity flowing! It was very quiet here yesterday as the children all went back to school. I always miss them when they do but there's no doubt that I get lots more done. I actually managed to get round to chores like renewing passports and booking dental appointments! "When's the best time to visit the dentist?" my daughter asked when I told them about the dentist while we were having dinner. I was just in the middle of rambling on about half term and getting up early when she interrupted me. "No," she said twinkling at me. "Tooth hurty!" I should be ready for her by now shouldn't I?! Gorgeous card, Vickie! Love all the embossing on here and the collage looking effect for the focal point. What a fabulous background folder Vicky and a gorgeous card and love the new stamps , great colour combo..
Beautiful card Vicky,mi love the stamped and embossed background, such great texture from those beautiful stamps too. Love the effect of the embossed stamping Vicky and the double layer of embossing is very pretty. simply gorgeous - great time abuot softening the embossing too. Absolutely fabulous! Love the fun mix of goodies you used here! Thanks so much for playing along with us at CAS-ual Fridays this week! Beautiful card Vicky, and I love the embossing. A real stunner Vicky. Love the slightly grungy look too, a favourite of mine. Thanks for joining in at MMM.